This week Paul and I are stepping well out of our comfort zone with a genre neither of us are 'fans' of. Jazz. 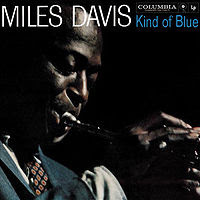 The album was suggested by @butterflygrrrl (LJ) who is a massive Miles Davis fan. Firstly let me say that I can appreciate the beauty and the technical brilliance of Miles Davis' trumpet playing. The album is considered his greatest and it does ooze class from every note. The man is a complete legend. I'm taken to some smoky café by the music, where I'm sipping on a warming black coffee on a cold day and possibly reading a book, but is that really where I want to be? Honestly and apologies to LJ, no, probably not. It just isn't my cup of tea. It's the sort of music I would love seeing played live to see how it's being created but to sit and listen to on your own? Nah. It's great background music, but to be honest I don't really do background music, I like to live inside a song and I can't seem to do that with Kind of Blue because I can't connect to it. It's not that I don't like this album, I can see why it's so popular, it's the best Jazz I've ever heard and the five lengthy tracks here do all sound gorgeously luxurious. The album was recorded in 1959 over the course of two days yet it sounds as though months of work have gone in to each track, every note so perfectly placed. I can not deny that there is a mournfulness to all the tracks that I like. However it doesn't move me in the same way that I'm moved by say a great singer, a great riff or a delicate acoustic number. So now I'm sat here, typing, wondering why that is. What is it about this music that doesn't touch me? Why can't I connect to it? It's an album that is in every top 100 list as being one of the greats but why wouldn't it be on mine? I think there's an element of it just not being 'music that I grew up with' so it's not part of my personal 'life soundtrack'. Ok, so it takes me to a smoky café (probably in France...) but that's not somewhere I've actually been. But there is a decision to be made here. Will it become part of my life soundtrack? Will my ears prick up when I inadvertently walk into somewhere (a smoky café?) and hear 'Kind of Blue' playing because I've been listening to it loads when I'm at home? Probably not. If you like Jazz and don't have this album then you should own it but my guess is that you already do. The 50th Anniversary edition has lots of alternate versions of the songs but I stuck with the original five tracks for this review but if you are a fan I imagine you'd love it. Me, not so much. Now go see what Paul thought at Blog on the Motorway for the Cross Blogination. I feel a bit similar to you to be honest. I really enjoyed listening to it, but it's not something I'll probably ever do again through choice. Firstly, thanks to you both for stepping outside your comfort zone and not just dismissing my suggestion of (whisper) jazz. This is, as you know Gray, very much the music I grew up with it, and a big part of my ‘personal life soundtrack’. For me, good jazz embodies love, hope, despair, passion. I connect to the mournful / melancholic vibe you both mentioned - the desire to be somewhere else, with someone else. I’m a sucker for that passionate romance I guess, and for me jazz is all about the longing. Maybe you need to experience live jazz to really feel it. Watching someone become completely absorbed in the double bass, or the sax, losing themselves in the moment. I love that about jazz. I see it in other genres too, but I feel it more with jazz.